Over the river and through the woods, from Indy to Carmel to Indy it goes....the Monon Trail, that is. What was once an abandoned portion of railroad tracks has been transformed into the Indianapolisarea´s premier bicycle and pedestrian path, stretching 15.2 miles from downtown Indy to Carmel, where it becomes the Monon Greenway. Along the way, the Monon winds through scenic Indianapolis real estate, unique retail shops and restaurants, city parks and myriad area attractions. The trail is open year-round and, depending on the weather, activities range from recreational walking to cross country skiing. Area runners gather weekly to test their times, and cyclists can upgrade or repair their equipment at one of the many specialty shops along the trail. Bike rentals are available at many locations, including the Carmel Cyclery. With the completion of the South Monon, users can make a simple jog to Massachusetts Avenue and downtown -- or connect to the White River Trail. 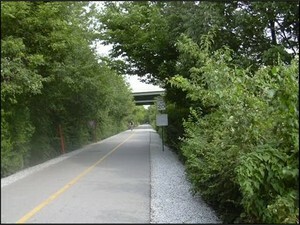 The Carmel Greenway connects to the Monon Trail in Indianapolis, and will eventually connect with Westfield's and Sheridan's trails. The popular 146th Street sidepath is also connected at the north end of the trail and runs east/west between Spring Mill Road and I-69 (Hamilton Town Center) in Noblesville. The Clay Terrace outdoor mall is located about 1/4 mile east of the Monon along 146th Street. Numerous additional trail connections are found along the length of the trail, including 116th Street, 106th Street, and along I-465.